Magnum Cash Advance sells itself as “smarter than a payday loan.” Their website is plastered with the catchphrase, bringing to life the adage about those who talk much, but say little. To be clear, saying you’re smarter than a payday loan isn’t saying much at all. Payday loans are historically unfavorable to the consumer. While they can help individuals in need of a one-time cash infusion who may not have access to other lines of credit, in general, payday loans are a terrible deal, regularly carrying triple digit APRs. So when Magnum Cash Advance sells itself as “smarter than a payday loan,” they’re setting the bar incredibly low. And when you set the bar that low, it’s especially impressive when you fail. A quick look at MCA’s posted interest rates and estimated APRs show they are actually worse than most payday loan options. Not that this deters MCA. The company goes to considerable lengths to emphasize that they don’t deal in payday loans. Rather, they provide “short-term installment loans.” What does that actually mean? It all comes down to how you repay the loan. According to MCA, the repayment plans they offer are all paid in small installments over a longer period of time. For example, most payday lenders operate on two-week, fixed sum repayment schedules. In contrast, MCA starts most borrowers with a 60-day loan period, and they say they charge you only for the days you borrowed the money i.e. you can save money by paying your loan back early. No matter how you do the math, it still works out to a terrible deal. That’s not immediately apparent on the MCA website, however. MCA provides the least amount of information on their rates possible, reserving a full disclosure of their rates, late fees, and penalties for you to read once you receive a loan agreement form. 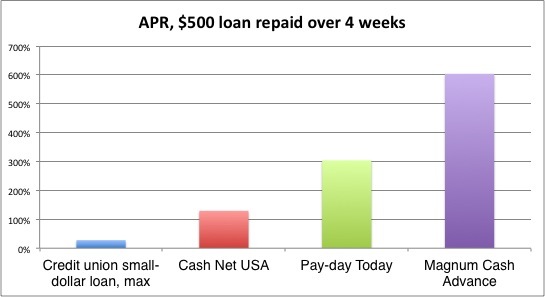 They do note, however that “A $500 loan from Magnum Cash Advance set-up for 4 bi-weekly installment payments will have an approximate APR of 604.06%.” That’s one of the higher APRs you’ll see for this sort of loan, and nearly double the 391% average usually seen in the payday loan industry. It should serve as a flashing, red light: stay away. If you do not want to enter into a consumer loan agreement based on the laws of the British Virgin Islands (BVI), you should apply for a loan at a provider located in the city, state, or country where you live. All aspects and transactions on this site, including your loan approval will be deemed by ICA to have taken place in the BVI. This transaction shall be regarded by ICA as governed in accordance with the laws of the BVI without regard to its conflicts of law principles, regardless of the order in which the parties agree. That’s right. By signing up for a loan on MCA’s website, you are agreeing to be held to the laws of the British Virgin Islands, as though your transaction took place in the BVI. The legality of MCA’s international loan making is murky at best, but a search of open or pending lawsuits against MCA (or their parent company International Cash Advance) turns up no results. There are, however, numerous complaints from individuals who claim that MCA turned to that little bit of fine print to exempt themselves from consumer protections enacted on a state level. Meanwhile, the state of New Hampshire Banking Department (MCA bases its call centers in New Hampshire) has taken matters into their own hands, and issued cease and desist order against MCA. Anyone can join with a $10 donation to the Financial Awareness Network. Contact a local financial empowerment agency for counseling.